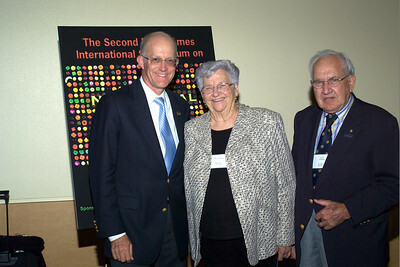 The highpoint for the Center in 2007 was the 2nd Bruce Ames International Symposium on Nutritional Genomics held on the UC Davis campus on October 12-14, 2007. 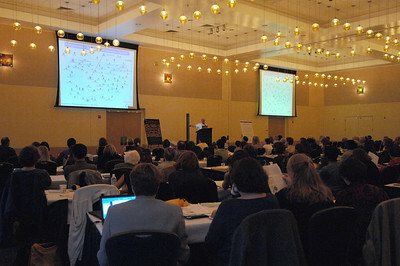 The Center, together with the College of Biological Sciences, hosted approximately 350 participants from around the US and 10 nations for a series of workshops and seminars dealing with the complexities of diet x gene interactions. 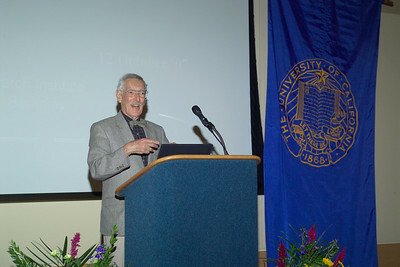 Former UC Davis graduate student, Dr. Roger Newton, founder of the Esperance Family Foundation and co-discoverer of Lipitor was the lead sponsor for the symposium. 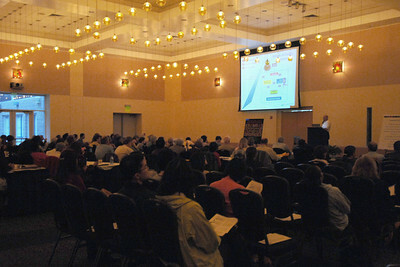 The three-day event covered a wide range of topics related to nutrition, genomics and health. 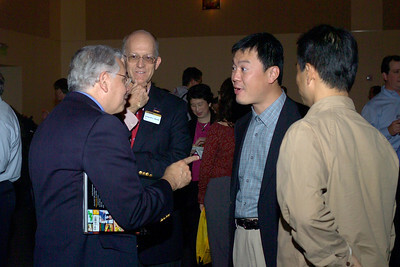 The theme for this year’s symposium was “Resolving the Diet-Gene Paradox”. 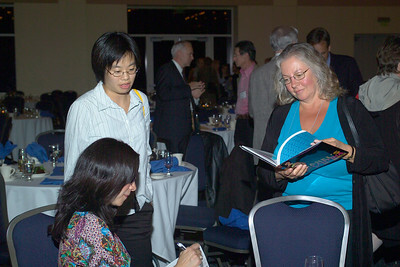 Speakers and attendees engaged in lively discussions about how diet and genetics interact and how certain constituent of diet such as vitamins, minerals and phytochemicals can alter gene activity in predictable and coordinated fashion to promote health and prevent disease. 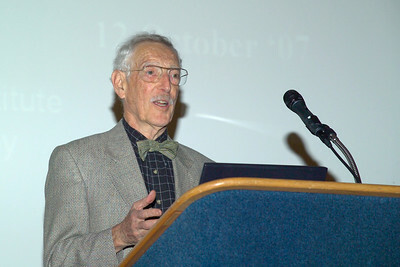 The kickoff speaker for the symposium was Professor Bruce Ames who spoke about “hidden hunger” and how the prevalence of vitamin/mineral deficiencies in children of low-income families can rob other organs and tissue of these essential nutrients setting the stage for late-stage chronic diseases. 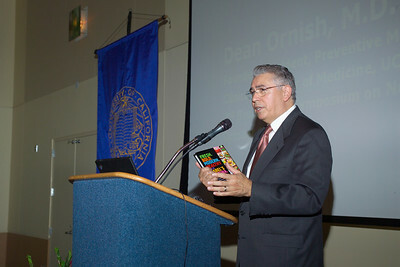 Other notable symposium speakers were Dr. 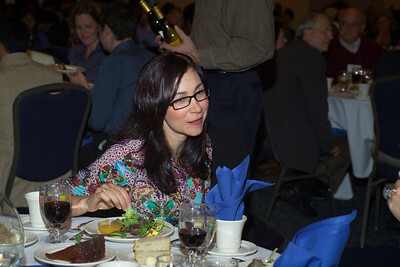 I. Sadaf Farooqi of Cambridge University who is recognized internationally for her pioneering work on leptin and obesity. 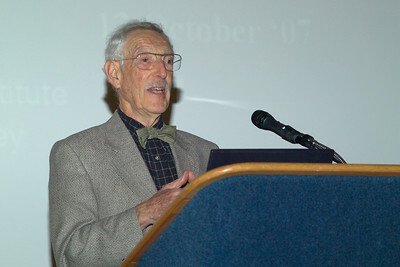 Harvard professor, Walter Willett, spoke on the four paradigms of cancer and Dr. Joseph Baur also of Harvard spoke on resveratrol, a polyphenolic in wine, and its role in promoting longevity in mammals. 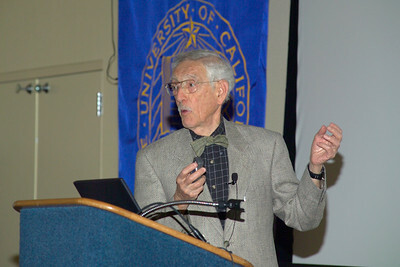 Dr. Dave Marin of the Children’s Hospital of Oakland Research Institute reported on his recent findings that fetal nutrition in mice can produce epigenetic effects that may be passed to daughters and granddaughters. 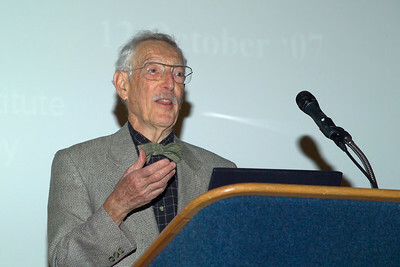 The concept of the “grandmaternal” effect has raised a number of questions about the long-term impact of poor maternal nutrition in humans. 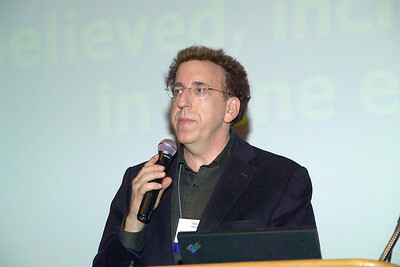 On Saturday evening, Dr. Dean Ornish, director of the Preventive Medicine Research Institute spoke on the comprehensive changes in gene activity as a result of diet and lifestyle changes and how these changes could reduce risk of prostate cancer. 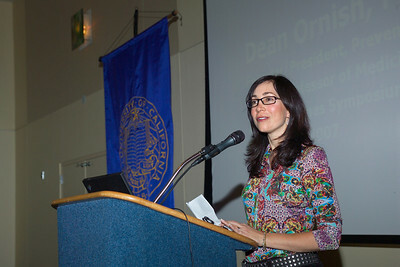 Dr. Ornish was introduced by popular West Coast chef and restaurateur, Isabel Cruz, who has been recognize by Maria Shiver as one of California’s most remarkable women for her efforts to promote healthy eating. 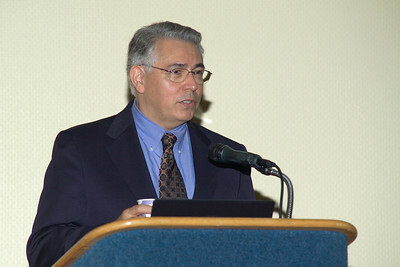 The symposium concluded on Sunday morning with presentations on the genetics of human taste perception and genetic variants in humans that increase risk for heart attack in response to high coffee consumption. 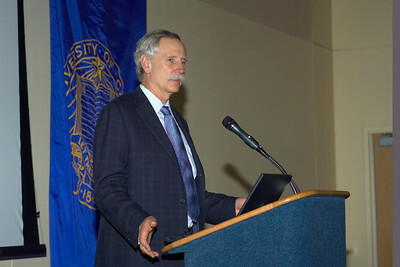 Professor Sven Ebbesson of the University of Alaska reported on a twenty-year dietary intervention program with the Alaskan Eskimo who suffer from high rates of type 2 diabetes and heart disease as a result of cultural and lifestyle changes. 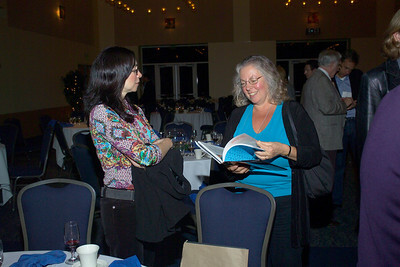 The final speaker of the symposium was professor Judith Gilbride of NYU, immediate past president of the American Dietetic Association, who called on registered dieticians and researchers to work together to get reliable and current information about nutritional genomics out to the public. 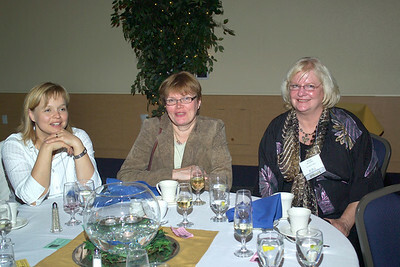 All in all, the symposium was a fitting conclusion to a very busy and productive year for the Center. 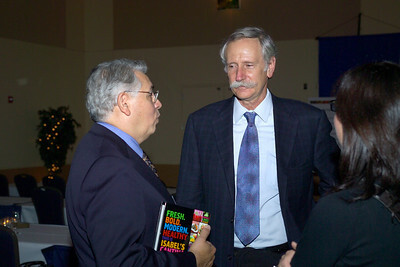 Dr. Raymond Rodriguez with professor Craig Warden and Dr. 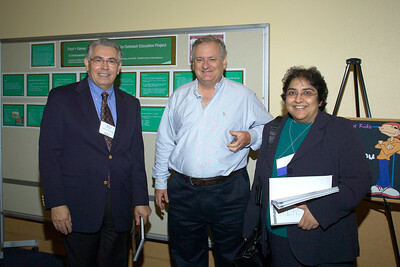 I. Sadaf Farooqi, symposium speaker in the poster display area. 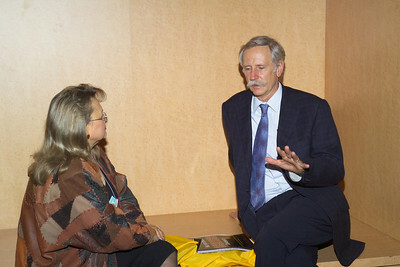 Dr. Esther Myers of the American Dietetic Association with professor Walter Willett at the Ames reception. 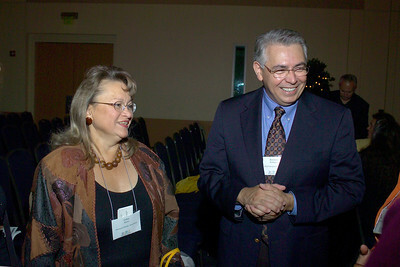 Dr. Esther Myers of the American Dietetic Association with professor Raymond Rodriguez at the Ames reception. 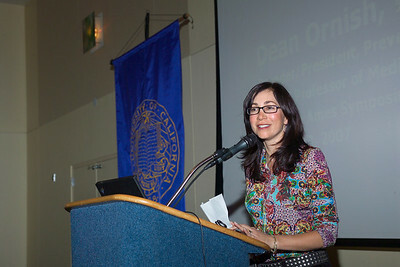 Ms. Isabel Cruz at the Saturday evening banquet. 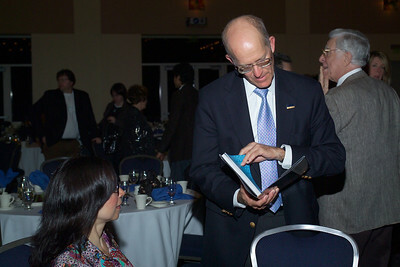 Dean Ken Burtis looking at Ms. Isabel Cruz's latest cookbook, Isabel's Cantina. 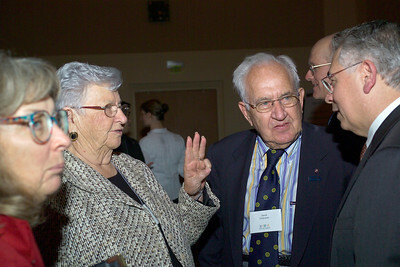 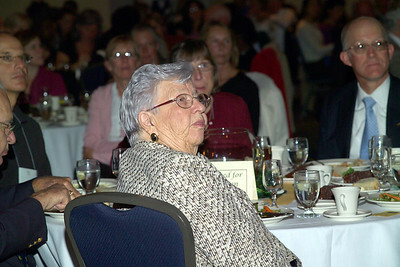 Dolly and David Fiddyment with Dr. Rodriguez at the Saturday evening (10/13/07) banquet. 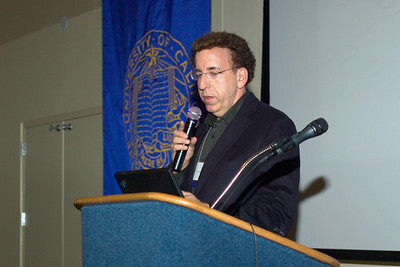 Dr. Dean Ornish speaking on "Effects of Comprehensive Chanes in Diet and Lifestyle on Gene Expression" at the Saturday evening (10/13/07) banquet. 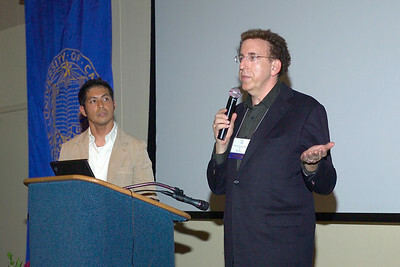 Dr. Dean Ornish and Dr. Mark Magbanua at the Saturday evening (10/13/07) banquet.